Unfortunately there was a noisy party held next door on our last night. Otherwise really enjoyed the stay and location. Lovely gardens, great location on the beach front with a small access road in front for scooters . Staff are always available. Nothing too much trouble. Rooms and bedding cleaned daily. Foxtel small fridge . New small 24hr convenience store at front entrance. Return customer have stayed 3 times now! The Pelangi is a simple Hotel but all you need for a comfortable stay for the price you pay! Perfectly located and plenty of extremely helpful staff on hand! We managed to get a refurbished room downstairs in a great part of the hotel! Thank you Pelangi! I loved the location and the rooms were good. Room balcony too small, felt very cramped, food Ok but nothing special. Overall I think if the balconies were larger it would be much higher rated in my estimation. Pleasant and helpful staff. Many included extras made the stay easier. Luggage storage and shower provided after checkout was great, no stress at end of holiday for late flight home. The service was fantastic and very friendly. The pool was a good size and we really enjoyed meeting other people at the swim up bar. Rooms are very clean and as soon as you leave the please clean my room sign up it was cleaned within 15 mins. Everything was very close and definitely would go back and stay again. Location was great. Only thing they can improve on is some of the food on the menu. The food was ok. Breakfast was ok and had what you neded. Other than that we had a wonderful stay. The location of the Pelangi is fabulous. It is steps away from a beach that is well looked after and caters for total relaxation offering beanbags, bars and the most amazing sunsets, and all this can be viewed from the comfort of poolside in the Pelangi grounds. 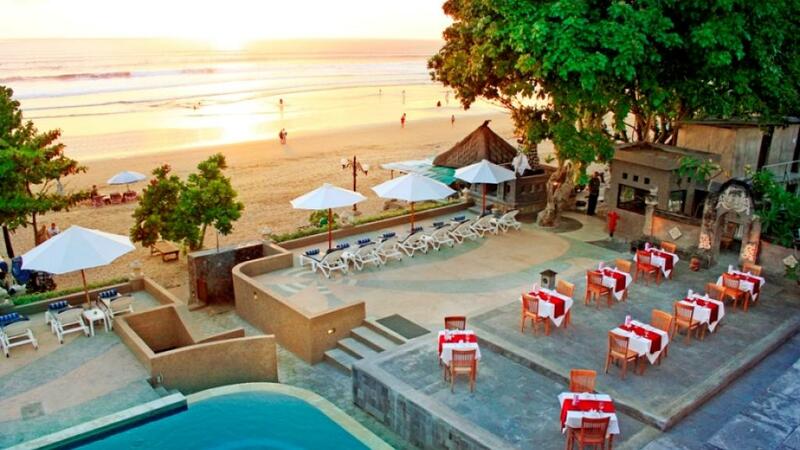 The hotel is a short walk from Seminyak's abundance of bars, restaurants and shopping. Once you step inside the Pelangi it is total peace from the outside, the staff are friendly and helpful and the rooms are perfect. We couldn't have asked for anything more. Fantastic pool area and swim up bar. Pleasant stay, great location, attentive staff. Our first trip to Bali and the hotel location was spot on. Service at the hotel was good, the food spot on and overall a clean well kept hotel. A small minus was the lack of WFI ireception in the rooms, with only the lobby seeming to b full strength . Possibly a touch disappointment with the room which was slightly aging. Overall the experience was good and we would consider the Pelangi hotel again. Absolutely fantastic position on the beach, value for money, great pool area with swim up bar! Only downfall was breakfast Bain Marie wasn't keeping food hot enough but that can be easily fixed. All up, we would stay there again and again. Lots of noise coming from the beach - we had to move rooms. Apart from that, very good. Stayed here July, a good hotel nearly on the beach there is a busy lane way between hotel and beach. Rooms were very clean serviced daily new sheets etc, but the set up of rooms is a massive long corridor prison like with rooms to one side ,with very small balcony if up stairs .Service from staff was excellent , breakfast was just ok , onsite spa was very good, booking of tours/money exchange is much cheaper outside on the streets. There is not a great deal of shops nearby like Legian , Kuta but is ok if you like walking. Overall would not go back to Bali as prices now for everything same as Australia. Going on tours are a nightmare ,traffic is unbelievable two hours out of town even longer back. The pelangi is great hotel in such a great location good price the rooms a very clean and serviced nice and early, the only two things that need fixing up is they really do need new towels they have seen their day, needs more soaps and t/paper along with shampoo and conditioner's and their roof top restaurant is way too expensive and the food was not very good at all hardly anyone there when we went, spent $115 AUD which works out to be in the millions in their money, but hey apart from that I am still going to stay there again such a nice place. This is not a family friendly place and is only suitable for couples or a groups of singles who do not spend much time at their accommodation. The hotel is a little tired and the service was poor,however the room and location was good. The hotel is clean but the service was poor, breakfast was very ordinary, the pool was good, but a bit restricted, but it was a great location. Love the Pelangi bali hotel, 3rd stay after 2 weeks touring bali, Relaxing resort on the beach, beautiful pool, rooms spacious and everything you need. Beachfront with beach bars. Street not far with nice restaurants and shopping. Freindly staff and nice breakfast overlooking the beach. Will return to the Pelangi next trip. Room great but balcony far too small. Location and staff were great, breakfast had all you need. We stayed in Deluxe room, which had a view of the ocean. Room was quite large and clean. Would go back there. 2nd time we have stayed at Pelangi & we'll definitely be back. Location is great, service is excellent. Room might not be 5 star but it was always clean & comfortable . No complaints - nothing negative to say. Was very pleased with accommodation,location and price of this hotel..staff super friendly and helpful.. Met many people who come back regularly and I'm sure we will too!! Probably not considered the best hotel but it is located well and it is good value. this hotel was in a great location. our room was at the beach end in a superior room which was plenty big enough for my husband and I. it is a long hotel but not a problem. the staff were so wonderful, all of them. the let us use a room to shower before we went to the airport late that night and stored our luggage. no safe in room but safety deposit boxes at reception which is better anyway.. would stay again. pool lovely. close to restaurants both beach front and behind on street. We arrived at the hotel just after midnight and we were welcomed by very helpful staff. The rooms were just lovely and well equiped. All the hotel staff were very freindly and helpful. We will def stay again. Great ocean front hotel. Pool area is lovely. Rooms bit small, & balcony on superior rooms are not worth having. Felt a bit like a prison walking to rooms as walls very high on sides & no view at the end either. Great beach at the front. Staff very nice. The atmosphere was exactly what we were looking for. RELAXED. Breakfast is pretty average.The attention from the satff was pretty ordinary. My travel companions got sick on the french toast or bacon.Obviously they had not read tripadvisor? Service generally is good ,problems are solved when required but you need to be assertive. Property is small so does not draw you into the bali experience.No in room safes is the biggest headache.I would probably stay at properties in the same location nearby but not there next time unless I had too.For the money...I think i could do much better next time along that coast with better options available.